How to Play Speed Hold’em? 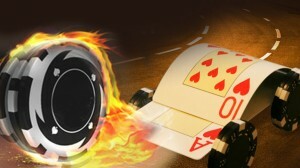 Speed Poker, also known as Speed Hold’em or Fast-Fold poker, is a new variation of poker that is played at a fast pace. Unlike regular cash games, the Speed Poker tables bring together players in larger groups and allows them to instantly muck their cards and be placed immediately in another table to play a new hand against a different set of opponents. This essentially keeps players involved in action at all times, allowing people to play more hands per hour. Speed Poker tables are displayed in the poker room lobby under a dedicated section. The great thing about Speed Poker is that all games start instantly, and you can fold out of a hand at any time, instantly moving to a new table and being dealt back in. You can join Speed Poker cash game tables in the same way that you would join other regular cash game tables. In Speed Poker, players do not actually join an individual game table. Instead, they join a player group, from which queued players are selected for the maximum of ten game tables to be opened and populated. A special feature of Speed Poker cash game tables is that the player can join the same player group more than once and, therefore, take part in the events of multiple Speed Poker tables at the same time. With the above-mentioned options, players can join up to ten times and, thus, be queued in a maximum of ten different places. After joining a game table, the player will receive notification that the game will begin shortly. This means that the game system is waiting for at least three players to join the game table in question, or that the player has been moved to a queue, from which players will be selected for new, opened game tables in the order of queuing. Once you know what you are doing, you will discover that speed poker formats offer you additional opportunities to make more money per hour in addition to just plain being a lot more fun. The first piece of advice I will give you though is not to be too ambitious at first, and stick to one speed table at a time, at least until you’ve gotten a good feel for how players play at your chosen speed poker site, stake, and format. How you play is going to depend on the kind of players that you are up against, as is always the case with poker in fact. Also, things will differ quite a bit depending on whether you are playing 6 max or full ring. As is the case generally, 6 max tends to be quite a bit more popular, so if you aren’t familiar with that format, it’s a good idea to hone your 6 max skills if you want to maximize your selection at speed poker. The truth of the matter is that speed poker isn’t fundamentally different than regular poker as far as poker strategy goes. If you consider what the real differences are, they cash out to your just not waiting around with speed poker like you do with regular poker. Other than that, it’s pretty much the same game. So when players ask me what sort of strategies they need to play good speed poker, my answer always is, the same kind of good strategies that you should be using in any game of poker, regardless of whether it’s speed poker or not. Having said that though, players who play speed poker tend to be light on good strategy in general, and you don’t want to count yourself among them. So to help you on your way, I will provide you with some good advice from a poker pro that will help you do better at speed poker.